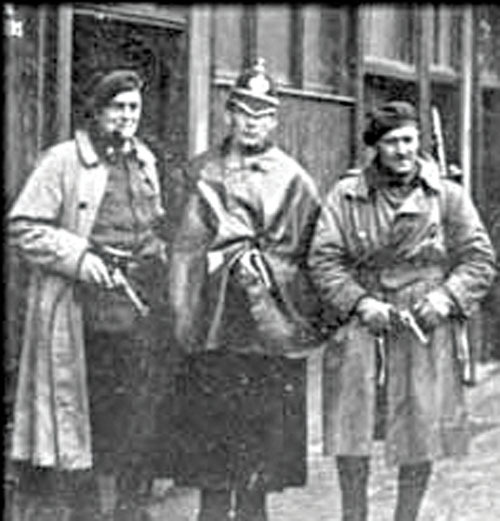 A dangerous job: An RIC constable with two Black and Tans during the War of Independence. Ó Máille’s house, Muintir Eoin, was a well known safe house for the IRA’s West Connemara Brigade. In March members of the brigade had shot dead two RIC constables (Charles Reynolds and Thomas Sweeney ), in Clifden. On April 5 a Black and Tan constable (William Pearson ) was shot dead during an ambush at Screebe. Between 18 and 20 IRA men were sleeping either in Ó Máille’s house or close by. Their OC Petie Joe McDonnell was alerted to the approaching danger. He quickly ordered his men into previously agreed positions. It appears that the RIC had set out on bicycles; which they left at the side of the road, and came towards the house on foot. Others advanced across the bog, where they had to cross a river. Local gossip had previously warned that the RIC knew about Muintir Eoin, and would raid it one day. McDonnell later told Ernie O’Malley* that the threats of a raid were probably made to frighten them off. The RIC did not want a fight. Now, however, the RIC was walking into an ambush. Suddenly a revolver shot rang out. It had come from the gun of RIC constable Boylan. Once again McDonnell later speculated that Boylan wanted to warn the IRA that an attack was imminent. Immediately the first shot was fired, in the growing dawn light and misty rain, the IRA opened fire. From elevated positions, the IRA easily managed to pin down the RIC. ‘ Bullets whizzed all around us like hailstones’, ‘ploughed through the bog and the road, while we lay there inactive except for an occasional opportunity to fire, knowing that if night came without relief we were doomed’... later recalled one constable to the press. After the initial burst of firing, and in between the showers and mist, the IRA settled down to sniping, some of which was deadly. Constable Boylan, who had taken cover behind a low sod fence on the roadside, was hit in the neck and died almost immediately. There was very little the RIC could do to extricate themselves from their position. Sergeant Hanley received two bullets in his right leg, one below the knee and the other in his thigh. Word of the attack quickly spread throughout the valley. Father Cunningham, the curate from Leenane, hearing that there were wounded men on the road, secured a car and ‘motored into the midst of the fighting’. He attended to the injured sergeant; but as he attempted to get to constable Boylan he was pinned down by fire and remained crouched behind his car. The situation was now a stalemate. As the morning wore on there was no sign of progress from either side. At noon another car came along the road, driven by Francis Joyce of Leenane. He was taking three labouring men to repair fences. As the car approached, oblivious of the battle ahead, constable Ruttledge (a veteran of the Screebe ambush a fortnight before ), ran towards the car, and stopped it at rifle point. He jumped on the running board and told Joyce‘ to drive like hell’. The car took off with Ruttledge clinging to its side. Bullets zipped round him. He was hit in his left arm, but he managed to hold on until they were free of danger. He quickly found a telegraph office, and summoned help from Galway. When the crown forces entered Muintir Eoin they found only Mrs O’Malley, a relation of the TD, her two children, an old servant women, and a young girl from a neighbour’s house. They were told to take some essentials with them, and to stand outside well clear of the house. Bombs were placed under the four corners of the roof. The house was blown up. In the out-buildings was bedding for up to 40 people, food and rifles, revolvers and ammunition. These were all put to the torch. A thorough search of the surrounding hills produced nothing. I have written before about the enormous challenges facing the RIC at this time. They were at the bidding of a dying regime. By 1921 many RIC constables had simply walked away from their duties. These were replaced by the Black and Tans. Some RIC remained in the force to somehow ameliorate the boorish behaviour of the Tans; others remained out of a sense of duty. Whatever the reason, at this time the RIC was a thankless and dangerous job. Next week: A vicious irony as Liam Mellows is executed in revenge for the assassination attempt on Pádraic Ó Máille. Both men were former comrades-in-arms during the Galway Easter Rising. NOTES: *I am taking details of the Kilmilkin battle from Beyond the Twelve Pins - A History of Clifden and District 1860-1923 by Kathleen Villiers-Tuthill; and the recently published The Men Will Talk to Me - Galway Interviews by Ernie O’Malley. **Compensation for constable Boylan’s children was later sought in the courts. They were rewarded £600 each, £3,000 in total. Constable Ruttledge was awarded £312; this was to include hospital expenses. Smaller sums were awarded to police who had their bicycles destroyed.